Whether it’s to make a bold statement or retain the character and charm of your period home, we provide timber front doors to perfectly suit any property. Using the latest technology combined with traditional craftsmanship, our timber doors are manufactured to provide industry leading levels of security, insulation, reliability and weather-proofing. Reassuringly solid and finished to the highest modern standards, with a choice of paints, ironmongery and furniture, our bespoke entrance doors can easily be adapted to match houses of any period including Georgian, Victorian and Edwardian homes as well as new builds. Constructed to last a lifetime from sustainably sourced timber, individually chosen for its grain, strength and quality, our doors require minimal maintenance. The bespoke detailing options we provide make it easy to retain the existing style of your home, matching new doors exactly with existing ones. If your new timber doors require glazing we can also supply a range of secure glass panels in many decorative finishes including etched, patterned and obscured glass – combining privacy, safety and extra light for dark hallways or entrances. 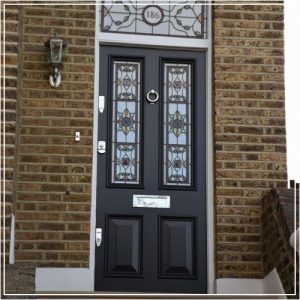 Likewise, if you require any special features, our flexible service and experience means we can install the perfect front door for any property. Security is naturally high on the list of requirements with any exterior door and all the locks we fit exceed the latest Association of British Insurers standards. We can also provide advanced modern locking systems or bespoke solutions on request and one of our experts will be happy to advise you on the best option for your home. Prepared and finished in our own workshop, installation is quick and efficient causing minimum inconvenience. Using precise measurements and the highest standards of craftsmanship we’ll ensure joints fit perfectly, seals are tight and that your new timber doors are as efficient, secure and long-lasting as they are beautiful. To arrange a time when one of our expert joiners can visit your property and advise you on the best solution for your home, or simply to learn more about our timber front doors give us a call today.